Convert is tried in absentia for ‘pressuring Muslim’ who urged him to return to Islam. 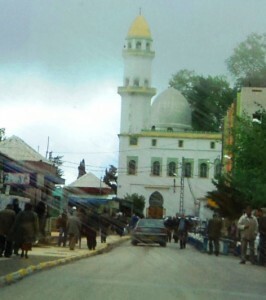 Mosque in Larbaa Nath Irathen, 25 kilometers from Tizi Ozou, Algeria, was formerly a church building. TIZI OUZOU, Algeria (Morning Star News) – Without any prior notice or summons from police, a Christian convert from Islam received word on Dec. 11 that he had been convicted of pressuring a Muslim to leave his religion, he said. Mohamed Ibaouene, 36, was convicted in absentia on July 4 by a court in Tigzirt and sentenced to one year in prison and a fine of 50,000 dinars (US$635), according to a copy of the judgment prepared by a court in Tindouf, where he held a position with an international business concern. “I have never been summoned by the police or any other authority – I have never been investigated by the police or gendarmerie,” Ibaouene told Morning Star News. When Ibaouene replied, “Yes, I am,” the young worker – identified only as Abdelkrim M. – began to try to persuade him to return to Islam, which he called “the religion of all Algerians,” the Christian said. Ibaouene refused to renounce Christ. Abdelkrim M. then asked him if he believed in Islam and, in spite of what Ibaouene had already told him, was astonished when the Christian told him he did not believe in it at all, but rather in God and Christ, Ibaouene said. Abdelkrim M. then filed a complaint with the National Gendarmerie in Tindouf, accusing Ibaouene of pressuring him to renounce Islam, according to a copy of the judgment obtained by Morning Star News. After the ensuing trial that took place in Ibaouene’s absence, the Tindouf court prosecutor requested a sentence of two years in prison and a fine of 100,000 dinars (US$1,270), but the judge ordered only half of each. Authorities did not serve the judgment to Ibaouene sooner presumably because he had left Tindouf after marrying in June and they were not aware of his whereabouts, and because of slow administrative processes. Ibaouene is part of an undisclosed church in Tizi Ouzou, capital of Tizi Ouzou Province on Algeria’s northern central coast. Upon receiving the judgment, Ibaouene obtained the services of a lawyer hired by the Protestant Church of Algeria (EPA). The attorney at the court of Tizi Ouzou, Mohamed Benbelkacem, filed an appeal on Dec. 15 in Tindouf, and a hearing was set for Jan. 23, 2013. Ibaouene has not been arrested. He was convicted under Article 11 of Law 03/2006, commonly known as Law 06/03, which places restrictions on religious practice for non-Muslims. The law mandates a prison term of two to five years and a fine of 500,000 to 1 million dinars for anyone who “incites, constrains, or utilizes means of seduction tending to convert a Muslim to another religion, or using for this purpose the institutions of education, health, social, cultural, or educational institutions, or other establishment, or financial advantage; or (2) makes, stores or distributes printed documents or films or other audiovisual medium or means intended to undermine the faith of a Muslim. Algeria’s population of 35.4 million people is more than 97 percent Muslim and .28 percent Christian, according to Operation World.